Learn more about this exciting new development in the German functional fitness scene. At least at some point in your functional fitness journey, you have probably overheard someone wondering why there isn’t a ‚League‘ for the functional fitness sport or asked that question yourself. This is exactly the same question Nico Bade (30, Berlin, Germany) and his friend Simon Stützer (31, Germany, Founder of the first German Boulder League) were asking themselves one day after another WOD was in the books. The question got stuck in their heads and together they developed their idea of what was to become the first German League for functional fitness called ‚Fitness Bundesliga‘. 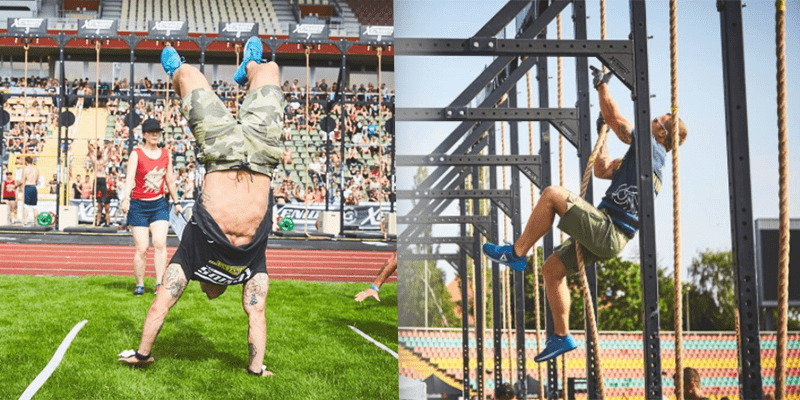 Why should there be a League for Functional Fitness? What’s the Fitness League about? The aim of the League is to find the fittest team in Germany by the end of a season. The process of determining the fittest team involves workouts consisting of gymnastic movements, olympic lifting, powerlifting and endurance work. Since the easiest access to all equipment needed for doing said workouts is through a CrossFit box, the main target group is a box or gym which is working with the CrossFit program. But of course you don’t have to follow the CrossFit philosophy to participate. To take part in the League a box or gym must be registered as well as every individual athlete competing. Stage 1 – Box Battles: In a 2-week period the 8 best athletes (4 male, 4 female) of every registered box are determined in 4 workouts. The individuals with the highest points get to be part of the team which represents the box during the next stages. Stage 2 – Division Battles: The country is divided into smaller areas called ‚Divisions‘ in which a certain amount of teams is competing against each other. Each team has to host one event for the other members of their division. After all teams have hosted an event the best 6 teams of the ‚Region‘ advance to the next stage. Stage 3 – Regional Battles: In this stage the smaller ‚Divisions‘ are fused into larger areas called ‚Regions‘. The best six teams of each region are competing against each other similar to the ‚Division Battles‘ to determine the best 2 teams of each region which will advance to the final stage. Stage 4 – Play Offs: In this final stage the 2 best teams of every region will come together at a central place to fight in a series of challenging workouts for the championship of the ‚Fitness League‘. Where can one follow the events? There will be a central League portal where all registrations, scores, workouts and leaderboards are shown. It is also planned to have a collection of highlight videos, photos and even a live stream available at the start of the league. One can also watch the events live as a spectator of course. If you register your gym this year, you will get an ‚early bird‘-discount on the registration fee, so be quick and sign up!